PS> Like my earrings? Enter in this giveaway for a $50 gift certificate to Christine Marie Studio! PPS> if you're interested in how I got my curly waves (though I added some dry shampoo)... visit this link! Is your hair actually curled with a curling iron here? I really like it! Cute earrings! Also I love your hair like that. I can't seem to ever get mine to stand up like that. I love yellow! You look so beautiful! Very cute!! I love your thrifted sweater ;) I'm terrible at thrifting, I need some tips!! I love this! Also, your hair looks amazing! PS: Do you have a tutorial on Bye Bye Beehive for this hairstyle? You are too cute. And I love your eyeshadow! I looove this look super cute. Also very summery like you said. I also love your hair in this. It looks perfect, super jealous. Love it! So perfect for summer! and just found your blog, love IT too! P.S. We both did yellow outfit posts today... coincidence? very bright and cute! love! Yay for yellow! 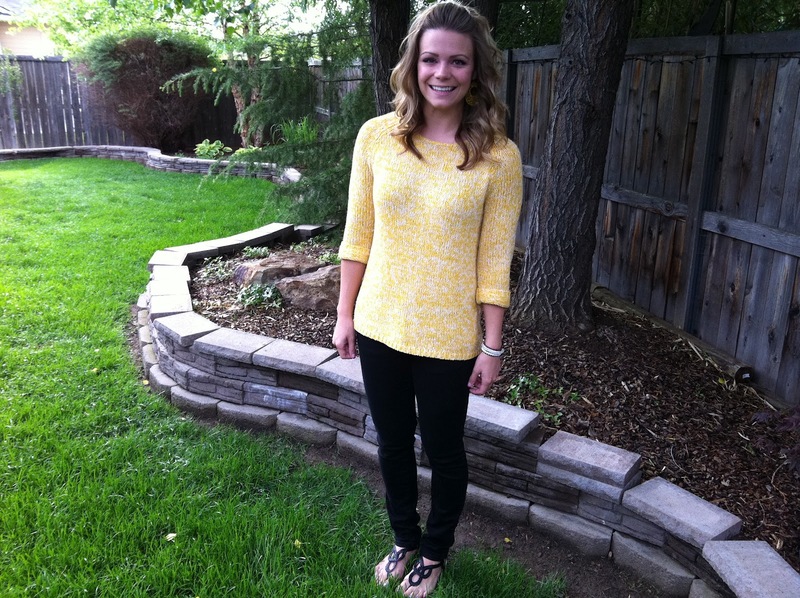 It wasn't until this spring that my closet had even met yellow...and now I love it! Your hair looks awesome...so wishing I could grow mine out! I am totally digging the new blog look. Also? Bring on the yellow! You are so cute! The Saucy-ness Just Got Upped. Quality Text Conversations with Daniel.